This classic soup is thickened with tangy soy yogurt and served cold, garnished with fresh cut chives. Well, at least that’s the way I like to enjoy it! Actually, a nice potato-leek soup is delicious served cold, warm or hot – and that is part of the mysterious charm circling this simple soup. Vichyssoise was created in the USA by a French chef who named the soup after his local town. As the story goes, the chef grew up in a small village near Vichy, France and as a child, he regularly ate the soup for breakfast. 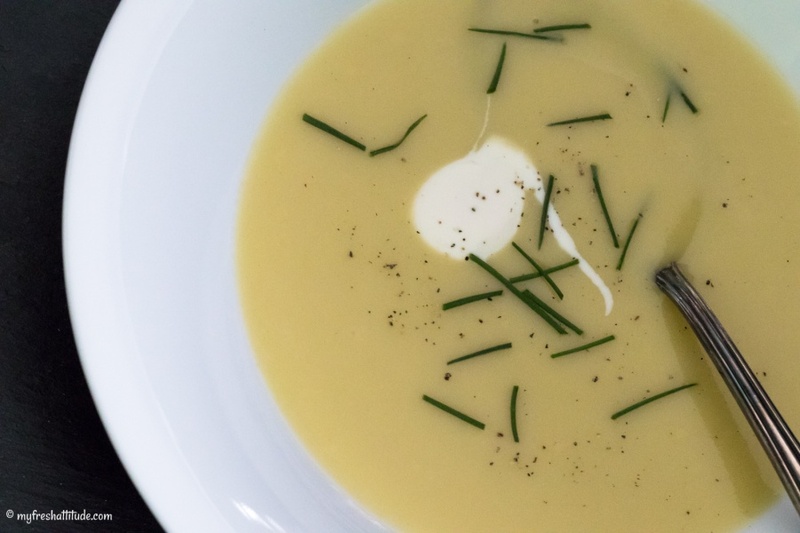 Today, the name vichyssoise is often given to any cold potato soup that is mixed with another vegetable. For best results, be sure to use starchy (mealy) potatoes to obtain a rich and creamy soup. And, it certainly doesn’t hurt to have a high-speed blender on hand to get a really velvety texture.